Yes, I know I am based in DC, but I have friends all over! One of my favorite people, my linesister Ihsaana, a fellow natural girl, FAMUan, Delta, and all-around great person, asked me for a favor, and I had to oblige. 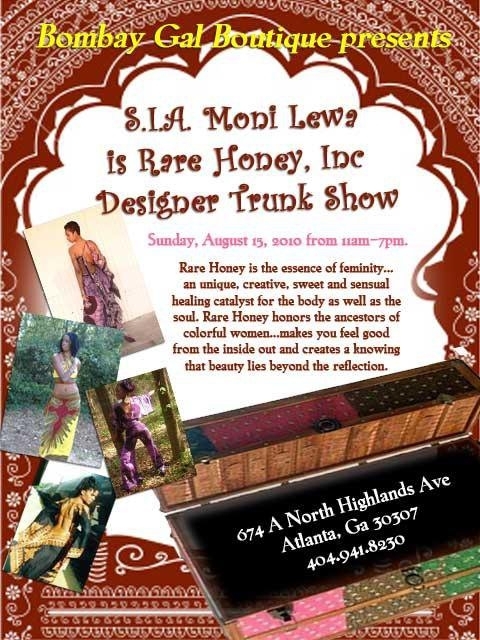 If you are in the Atlanta area, or know some people in the Atlanta area, I strongly encourage you to attend this trunk show on Sunday, August 15. I may have to ask a few of you to pick up some items for your favorite Southern girl! See below for details! For all my Earth Sisters, bohomeian Chicas and Funky Fashionistas…..
Bombay Gal Butik Presents………Rare Honey, Inc. Designer Trunk Show! Come and Experience the amazing Afro Chic Designer S.I.A. Mona Lewa!!! Her designs are the essence of femininity….an unique, sensual healing catalyst for the body as well as the soul. Rare Honey honors the ancestors of colourful women…..makes you feel good from the inside out….and creates a knowing that beauty lies beyond the reflection. Enjoy our complimentary refreshments and take in the sweet sounds. See you there!